These two inspiring quotes come from the writings of John Muir, a Scottish-American naturalist and environmental philosopher. He was a true pioneer in North American wildness conservation who hailed from a small fishing town in Scotland called Dunbar. After emigrating to Wisconsin during his childhood, he went on to campaign for the National Park bill, which was passed by Congress in 1890. Following this success, he then encouraged congressmen to take an active interest in preserving large areas of wilderness across the United States, leading to the establishment of National Parks in America, including Yosemite National Park. It is no surprise that he had such a passion for nature – he no doubt had been inspired by the breathtaking scenery in his home country of Scotland. He is a particularly relevant figure to mention in this blog post, as the National Trust for Scotland is also dedicated to preserving our natural environment. In 1950, the National Trust for Scotland bought Ben Lawers to protect and conserve its rare plants. Since then, it has expanded the protected area, and now carries out a pioneering restoration and conservation program. This year marks the 65th year since the NTS acquisition of Ben Lawers, meaning its inclusion as one of this year’s Priority Projects is particularly meaningful. It’s the 10th highest Munro in Scotland (in Scotland, a mountain is officially classified as a munro if it is over 3,000 feet high). There are 282 munros in Scotland! 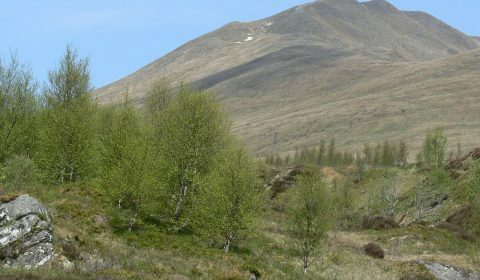 The central Highlands region where Ben Lawers is situated is particularly known for its famous peaks; Ben Lawers is the highest in a ridge consisting of seven successive Munros. However, there’s a lot more to this Munro than just it’s impressive height! 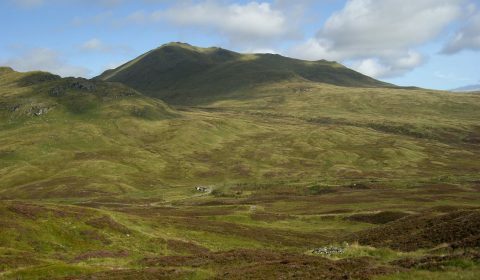 The Ben Lawers property actually comprises 7 of the Munros in this mountain range, but Ben Lawers gives the property its collective name, being the highest of all 7. It is also home to a wide variety of Scotland’s wildlife; from red deer to red admirals, the mountain and its surrounding area is absolutely teaming with Scottish wildlife. What’s more, it was the first NTS property which was purchased primarily for the purpose of nature conservation. Ben Lawers has the largest abundances of arctic-alpine plants in the UK, as conditions on the mountain are ideal for the species’ survival – the soil is full of rich minerals. The rare species found here include snow gentian and alpine forget-me-not, which are found in only a few other places in the UK. What’s more, the reserve is also home to many mountain mosses and is the UK’s most important site for lichens, with over 500 types found here. And lastly, it is one of NTSUSA’s 2015-2016 Priority Projects! Since the 18th century, when the first rare species was discovered on its slopes, plant specialists from around the world have come to Ben Lawers to investigate and record its flora. More than 30,000 visitors each year come to Ben Lawers, many of them to scale this well-known Munro. At the summit, they are rewarded with incredible views of Loch Tay and the hills and mountains beyond. Just short of 4,000 feet in height (3,984 feet), it stands proudly over Loch Tay, with snowbeds lasting well into the summer. On a good day the views from the top of Ben Lawers are spectacular! You can see Loch Tay, to the south, but you can also look over towards Meall Greigh at the east end, over Lochan nan Cat, which is encircled by An Stuc and Meall Garbh. 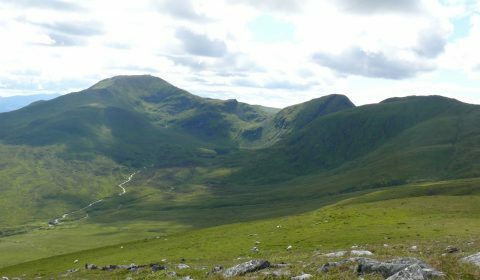 The other Trust peaks in the Ben Lawers massif, Beinn Ghlas and Meall Corranaich are also visible, and then there is Meall nan Tarmachan and its precipitous top, Meall Garbh. In the distance to the west you can see Buachaille Etive Mor at the entrance to Glencoe, Ben Nevis, and the surrounding hills. Walkers are always welcome and are actively encouraged to visit Ben Lawers to “bag the Munro”. 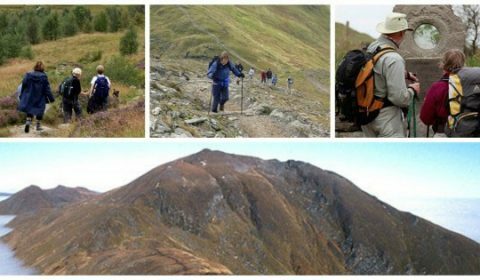 Keen hillwalkers and mountaineers are known to avidly “collect” Munros, tackling them in turn and adding them to their list of mountains accomplished. Dedicated “Munro baggers” can even cross 7 off of their list in one day alone, by walking along the 8 mile length of the ridge. Further down the slopes, walkers of all abilities can enjoy less arduous routes; those who choose not to climb to the top can still take in the scenery and views of Loch Tay while appreciating the various flora and fauna around them. With footpath erosion being an unfortunate consequence of the area’s popularity, work to counter the erosion caused by walkers and the Scottish weather is one of the ongoing aspects of the NTS’s management work at Ben Lawers. Ben Lawers accommodates many species of native Scottish wildlife, too. The ecosystem in place ranges from the humble butterfly to the great red deer, with many interesting species in between! The great abundance of insects is ideal prey for the area’s birds, which include whinchat, stonechat and willow warblers. The mountain and its surrounding environment are also home to some of Scotland’s most recognizable bird species, such as the red grouse and ptarmigan. 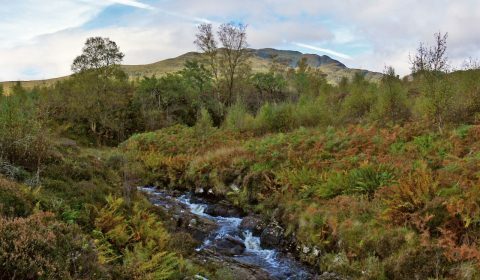 Ben Lawers relies on philanthropic income to continue with its environmental initiatives as the property has no endowment, and few commercial opportunities. Support from organizations like the National Trust for Scotland Foundation USA are paramount to the maintenance of Ben Lawers. 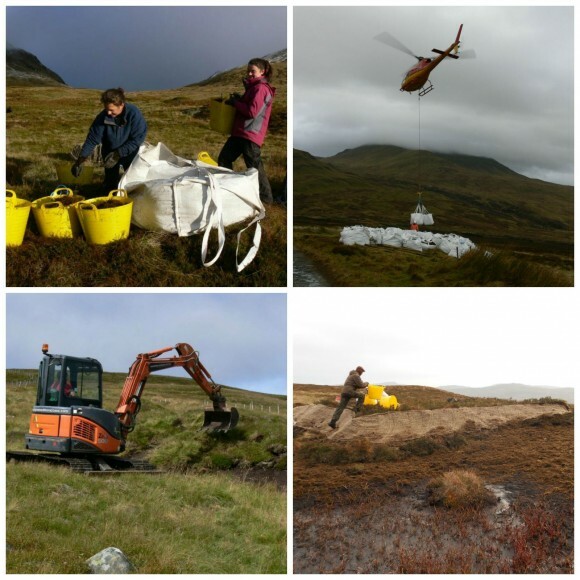 The Vital Habitat Enhancement project at Ben Lawers is one of our 2015-2016 Priority Projects, which is currently in need of financial support. This initiative has three key focuses which are detailed below: grazing management, habitat restoration, and peat restoration. Grazing management – John Muir once referred to sheep as “hoofed locusts” for their destructive effect on plant populations. Heritable rights to graze animals in the Ben Lawers area, granted at the time the NTS purchased the property, impact many habitats and species. Sheep are not the only culprits though; red deer and roe deer often damage young trees and shoots in an attempt to find nourishment. The most effective way is for the Trust to gain control of heritable grazing rights and over the last 25 years we have bought out a proportion. In the past this involved bidding on the open market when farmers chose to sell up, requiring us to raise sufficient funds at short notice. More recently we have been more proactive in approaching graziers, particularly those considering down-sizing or diversification, but this relies on having funds available to back up negotiations. 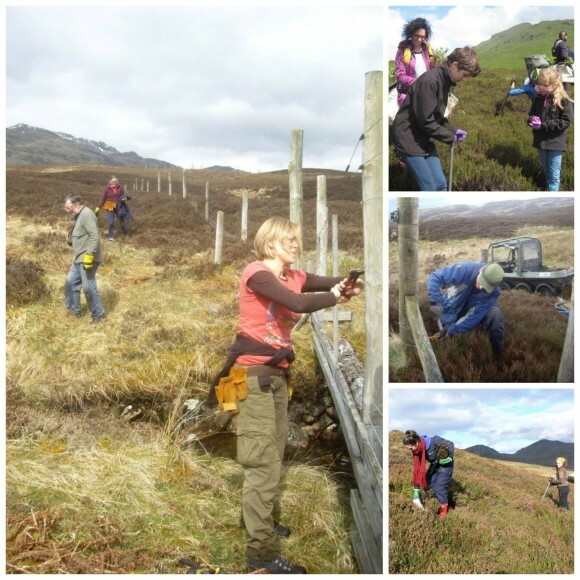 Staff and volunteers planting within our high altitude montane willow scrub enclosure, and maintaining fences on the property. We would like to shift the focus of our pioneering habitat restoration onto Salix myrsinites (Whortle-leaved Willow) which is now the most threatened of the montane willow species. This will involve seed and cutting collection, propagation and planting over the next 2-3 years. Support is required to continue with these efforts. Funds are needed for digger hire (for restoration of eroded hags), the purchase of biodegradable netting, materials for footpath construction and the cost of airlifting them to site. Ensuring that the carbon continues to be held from the atmosphere by the peat is vital to combating climate change and greenhouse gases! To preserve this special NTS property and to maintain its fragile ecosystem – both today and for the future – we must act now!